During his lifetime, Sufi Abdul Wahid Khan Chisti Sabri was the acknowledged master of the Kirana style. His revival of Khayal at the turn of the 19th century stands, in itself, as a virtually unparalleled contribution to the recent history of Indian Classical music. Abdul Wahid Khan began his studies at an early age with his father, Abdul Majid Khan, learning vocal and sarangi. Around age 12 he was sent to Kolhapur to study with Haider Baksh Khan, who was a disciple of the reknowned master of the beenkar (vina) and voice, Mian Bande Ali Khan. Although a youthful prodigy of the Kolhapur court, remaining unchallenged after his public debut there at age 18, Abdul Wahid Khan had no inclination to spend time singing in the courts. Instead he lived a devout, reclusive life, singing in the presence of holy men and at the tombs of Sufi saints and only occasionally sang in public. The most striking fact on his performance was apparently his alap. The time he took, the care, to elaborate the raga was exceptional among khayal singers: he might take hours on one raga. When Salamat Ali Khan was asked by one of his disciples for a description of Abdul Wahid Khan, he replied, "He would begin to improvise in Lahore and you could travel to Delhi and back, and he would still be improvising. More than that you don't ask." Ustad Ali Akbar Khan said that when most musicians came to the radio station, they sang their raga and went home. When Abdul Wahid Khan would come, however, he would sing his scheduled broadcast and then just continue for 20 hours or so. People would come and go, and he would still be singing. His command of the art was such that no other musician ever performed in his presence. Abdul Wahid Khan practiced Todi and Darbari day in and day out. When asked why he limited himself to only two ragas, his response was that he would have dropped the second one also if morning time could last forever. One lifetime, according to him, was not enough to do justice to any raga. He was forced to change from Todi to something else only because of the setting sun and the gathering darkness. Born in Kirana, he later moved to Lahore where he made an independent career until his death in Saharanpur in 1949. Ustad Abdul Wahid Khan was inferred the title of "Sirtaaj-e-Mousiki" the Crown of All Musicians, The King of Music. He had a most religious and pious attitude to life, paying homage throughout his life to his pir the Sufi, Khwaja Ali Ahmed Nafi Alam, a saint living in Multan in the Punjab, now Pakistan. Requiring rigorous discipline and fierce devotion, Abdul Wahid Khan accepted very few disciples, among them Pandit Pran Nath who became one of the most important disciples through his ceaseless practice, natural talent and extraordinary ability to serve his master. For almost 20 years he served his Guru and in 1970 came to the USA where he has many disciples in New York, California and Oregon including the American composers La Monte Young and Terry Riley. Ustad Abdul Wahid Khan had only one surviving son, who followed in his father's footsteps to also become a great musician on the sarangi and voice. Ustad Hafizullah Khan was a senior artist with the highest ratings at All India Radio in Delhi for over 35 years. One of the most outstanding instrumentalists was the famous Ustad Bande Ali Khan. Bande Ali has been called the greatest binkar (veena) player of modern times. Born in c.1826 in Kirana, he first lived in Gwalior, then Indore and died in Pune in 1890. His father, Sadiq Ali Khan, was a binkar player and his maternal uncle, Bairen Ben, was a prominent drupad singer of Alwar and Jaipur. There is some contraversy over Bande's training. Some say he was a disciple of Nirmal Shah of Benares others say he learned from Umroa Khan. Bande was a practicing Sufi and stories tell of unusual powers that he possessed. Although primarily known as a binkar, he is associated with khayal and sarangi as well and is considered the founder of the Kirana gharana. Bande Ali added elements of khayal to his bin playing without compromising the bin idiom. He was a powerful force in his time and seemed to also be an innovative musician. He had a large following and many students and disciples. 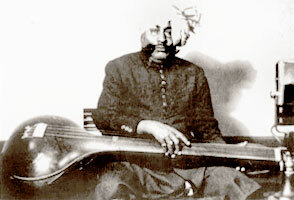 Bin player, Rajab Ali Khan, a court musician of Dewas in Jaipur, was trained by Bande Ali as was the great sarangi nawaz, Haider Baksh of Chrapoli. 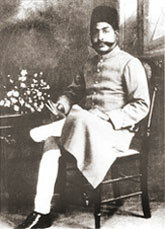 Gwalior had become a leading center for vocal khayal during the rule of Jayaji Rao Sindhia (1843-1886). The eminent singers Haddhu and Hassu Khan were the pride of his court. Bin player Bande Ali also spent some time in Gwalior. It is said that after an impressive recital at the royal court of Gwalior, Jayaji Rao spontaneously offered the Bin player anything he wished as a reward. Without hesitation, Bande Ali asked the king to present him with Chunnabai, one of the monarch's favorite songstresses. She became a dedicated disciple and the faithful partner of the great maestro, who was the most outstanding musician of the Indore court of Maharaja Tukoji Rao Holkar II (ruled 1843-1886). Abdul Wahid Khan biography © La Monte Young and Marian Zazeela 2005. All Rights Reserved.